Is it just an Aussie thing to have a lemon tree in the backyard? Our lemon tree took a while to get going, but now we have an abundance. :) What to do with all the lemons? Middle teenage daughter likes putting a squeeze of lemon in hot water in the morning and the rest of us like it on our fish. Preheat oven to 175 degrees Celsius (350F). Mix almond and coconut flours, coconut and baking soda together in a bowl. Warm cashew butter and honey in the microwave. Add warmed cashew butter, oil and honey to the dry ingredients and mix well. Scoop tablespoons of cookie dough onto baking paper on baking tray. Cook for 7-8 mins until light golden brown. Careful, they brown quickly! Take out of oven and cool on trays - they are fragile but will crisp up on cooling. For icing: Melt the coconut oil slightly and mix with the honey. You can either add the lemon zest to the icing or sprinkle it over the top of the iced cookies. Wait until cookies are cold before icing. If icing is too stiff, warm slightly in microwave before spreading. 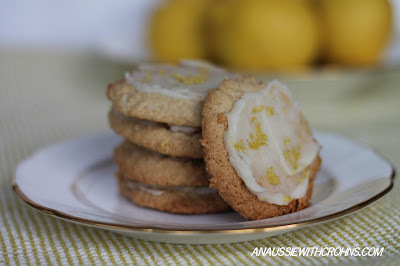 Is there some lemon missing from the cookie part of this recipe? LOVE these. Following you on G+ and I am pinning and bookmarking as well. Nice to meet you! These are the best paleo compliant cookies I've ever had! Love them.